On Saturday, July 14th, the Friends of Namekagon Barrens Wildlife Area is sponsoring a nature walk. Meet the leader, Mark Nupen between 8:30 and 9:00 am at the Friends clubhouse, 33174 Gomulak Fire Lane, Danbury, WI. Watch for red and white signs at the intersection of St. Croix Trail and Gomulak Fire Lane. Walking will be a leisurely mile or so and will last about 2 hours. Bring water, snacks, bug spray, and a bucket for blueberry picking! A toilet is located at the clubhouse. Thank you to all who attended. We had a great nature walk! We started at a favorite spot, which is the Forest Home School on St. Croix Trail road just west of the Barrens Cabin. Lots of flowers of course and we talked about the old school house and how this originally was a farm community with its own school and farmers. Of course it all failed but it is part of the story of the Barrens. Native Americans successfully used the land for its plants and especially the blueberries which grow best in the fire-impacted lands of the Barrens. We walked north from the school along the small trail just west of the school house. Then we headed out on Gomulak Fire Ln and Clemens Road. We could hear the calls from the Uplands Sandpipers nearby. When disturbed, the Uplands put on a spectacular broken wing act to lead divert attention from their nest area. We could also hear the Sharp-tailed grouse nearby. I wanted to show one of my favorite plants, the Sweetfern. I love its fragrance and appearance which is quite densely located in some areas but other areas hardly any. So we went east and south of Clemens road and found lots of sweet fern plants. Sweet Fern was an important herb used by Native Americans. I love this plant because it is like ‘perfume’ on the Barrens. Where it grows thick it’s fragrance is all around you. We all had a great day on the Barrens. Concrete foundations of what likely were silos for hay on the homestead of William and Mary Clemens. Vern Drake and Dave Peters visited Jim Anderson on June 5, 2018, and he shared with us several documents, photos and his memory of his grandparents and other people who lived in the area around Little Sand Lake in the west part of the Town of Minong and in the east part of the Town of Blaine. This is a summary of that visit written by Dave Peters. If the people who eked out a living in the barrens in the early 20th Century live on through anyone, it would be Jim Anderson, who lives on Little Sand Lake in Washburn County, just east of the Namekagon Barrens. Vern Drake and I spent a couple hours with Jim one afternoon a few days before his 83rd birthday in early June 2018. 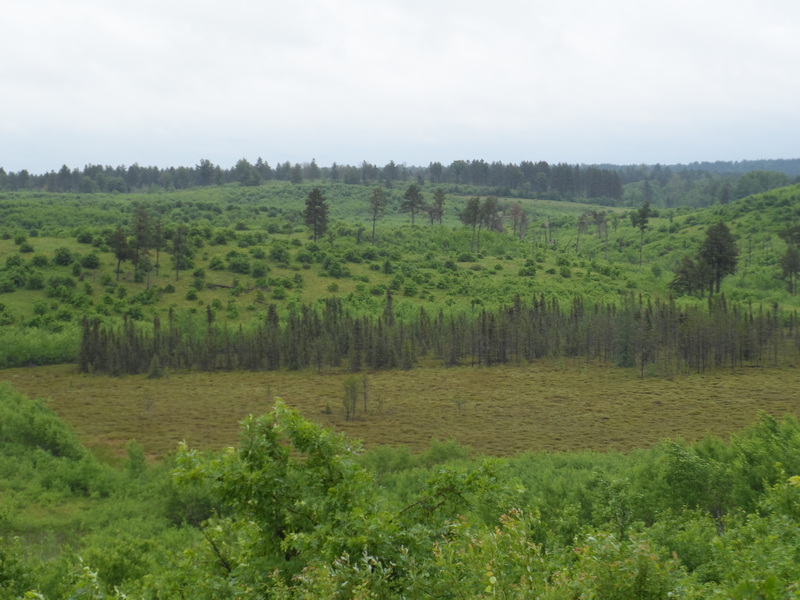 The Friends of the Namekagon Barrens Wildlife Area held their annual open house June 9, 2018, a little earlier than in past years. We gathered as always at the cabin on Gomulak Fire Lane, but this year we had the benefit of the just-completed picnic shelter to ward off the few sprinkles of rain. The Friends of the Namekagon Barrens is leading a series of Nature Walks during the summer of 2018. The first was led by Gary Dunsmoor (above) on the morning of June 16. Gary has been a powerful advocate for our Barrens for over 40 years as both a DNR employee and Freind. The south boundary of the South Unit is home to the the only sizeable stand of native lupine in the NBWA. The endangered Karner’s blue butterfly depends entirely upon this plant for propagation. Our location is thought to be about 20 miles north of historic range for both the lupine and the Karner’s. 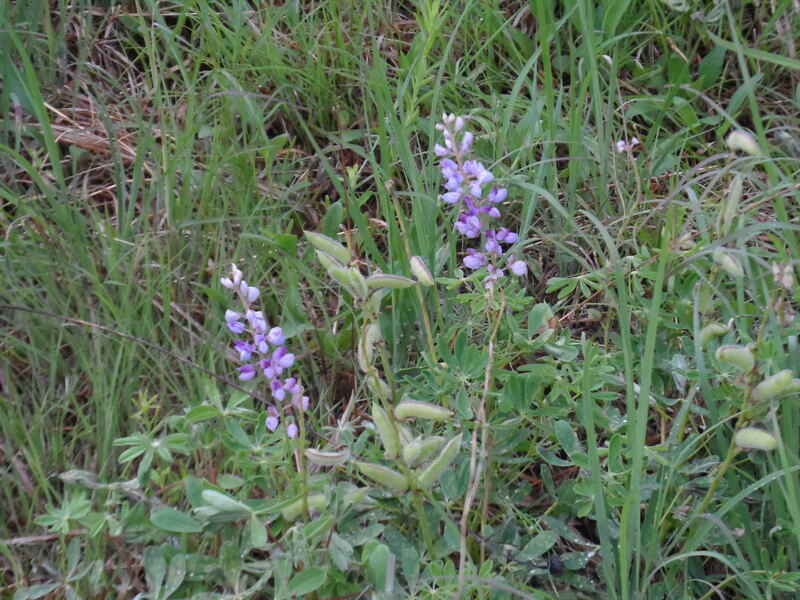 The nature walk confirmed the lupine’s 40-year continued presence on the same large south-facing hillside (below). We arrived just after a summer thunderstorm with wind and overcast hanging around, and predictably, butterflies were not flying. Other hillside flower species were puccoon, moss phlox, and harebell, Song birds identified were black-billed cuckoo, golden-winged warbler, chestnut-sided warbler, black and white warbler, song sparrow, eastern towhee, eastern kingbird and least flycatcher. The northwest corner of the South Unit contains a series of large bogs plus a sizeable bog pond. The area does not have a name, but Mark Nupen and Jerry McAllister think it should be called Duns Moor. Gary is of 100% Scottish descent. 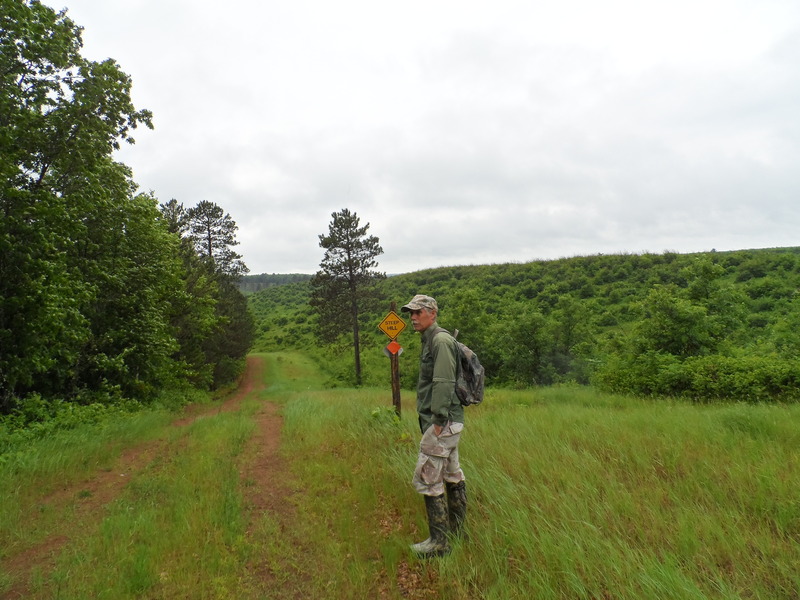 The hike began near the intersection of River Road and Namekagon Trail. The view from the starting point is stunning (below). It is from 2-300 feet above the bog and pond and captures both plus a sizeable portion of the 19th Century overland wagon road from Fort Snelling to Madeline Island. Native Americans used the same pathway for hundreds of years to get from Lake Superior to the Mississippi River, well before Zebulon Pike’s establishment of Fort Snelling. Primary bog plants observed near the pond were cotton grass, small cranberry, pitcher plant, bog rosemary, pale swamp laurel, Labrador tea, leather leaf, and lots of sphagnum moss. Gary provided all of these identifications. Butterfly weed provided its usual showy orange near the trailhead leading to the pond. Birds about the bog and pond were black-billed cuckoo, golden-winged warbler, eastern kingbird, eastern towhee, mourning dove, Canada goose, and hooded merganser. Insects were noticeably absent. The lilacs of Severne Bradley were the telltale, opening a window on a century-old community of struggling farmers in the sands of northwest Wisconsin. In a mixed forest of pine, oak and aspen a half mile south of the main unit of the Namekagon Barrens Wildlife Area in East Blaine, Vern Drake, Mark Nupen and I spent a late May morning exploring remnants of at least four settler homes in what was the community of Fivemile. Fivemile was a short-lived and geographically ill-defined barrens farming settlement of more than a 100 people, with a general store and a post office that lasted from 1908 to 1920. What we saw were a few tangible reminders of a few farm families who settled on the dry, sandy barrens starting just after 1900 and remaining a few decades at most. Two sisters who grew up there recalled years later that this was a time of picking blueberries with Indians, house parties, cold winters and, finally, departure. We were guided by Kraig and Kory McConaughey, brothers whose family has had a cabin in the area for decades and who have poked around in the woods for years. We made several stops and identified the scant remains of homesteads of William and Grace House, Olaf and Rena Johnson, Henry and Mary Zach and, perhaps most satisfying and evocative, Ingebregt T. and Severne Bradley. The Bradley homestead lies on 160 acres mostly southwest of Bradley Lake, on the Burnett-Washburn county line. A short driveway off Fivemile Road led to a clearing in the mixed forest several hundred feet across. Most remarkable was the pink-lavender lilac bush in full and fragrant bloom. The lilacs seemed to provide more clearly than anything else we saw an account of a century-plus-old effort at settlement and domestication. We easily found the adjacent square foundation of a house measuring about 36 feet by 36 feet, each block of poured concrete about two feet long and perhaps 10 inches wide. The walls were gone, of course, but there were smaller depressions nearby, perhaps outhouses, storage places or the like. We saw two other structures nearby. Another set of poured concrete blocks marked the rectangular foundation of what was perhaps a barn, and a circle of blocks were the remains of what was apparently a silo, about 12 feet across and several courses high. The Bradleys arrived in east Blaine Township around 1904, according to the Burnett County plat book, and homesteaded the 160 acres. Ingebregt (sometimes spelled Engebregt or Englbregt) was born in Norway in 1854, Severne (sometimes spelled Severene or Severena) was an Olson from Minnesota, born in 1868. They had married in Albert Lea, Minn., in 1887. They came to the barrens with at least three children, possibly five, and had a sixth while living there. The 1910 census shows four children living with them, ages 3 to 17. Ten years later, the 1920 census shows the only person living with the couple was their granddaughter Evelyn Bertone, apparently the child of their daughter Tena. By this time, Ingebregt was 66 and Severne was 52. Records are incomplete but it seems likely that three of their children, daughters Carolyne and Stella and son Severt, lay buried a mile west in Evergreen Cemetery. By the time of the 1930 census, Ingebregt had died, and Severne was living alone, listed as a “farm manager” in the census enumeration. Daughter Tena was married and living in Chisholm, Minn. Her daughter, Evelyn Bertone, likely born on the barrens in 1913, lived with relatives in Spooner and later worked in St. Paul, Minn., as a file clerk. In 1935 or 1936, apparently after a failure to pay property taxes, the farm was foreclosed on and the land went to the county. That was the eventual end for virtually all homesteads on the sands of the barrens, but this homestead stands out among those for miles around partly because the buildings were of a size that almost suggests relative prosperity and also because it had been inhabited by the same family for so long. The building foundations and the lovely touch of lilacs are all that remains. Lilacs were introduced to the North American colonies in the 18th Century and were a popular – and long-lived – flowering bush in climates where the May blooms were particularly welcome after a hard winter. It’s compelling to think of them as Severne’s lilacs, marking a homestead where she gave birth to her youngest, saw a daughter grow up and move on, witnessed the death of other children, then outlived her husband. The four homesteads we explored didn’t last long and there is little left of them. The land has largely grown over in aspen, oak and jack and red pine and is mostly owned by Burnett County as a result of the difficulty settlers found in making a go of things. But they are evocative remnants of a group of hardy people who came from all over, struggled to make a living on tough land and ultimately had to concede to the reality of nature.